Whitefin features in the Top Ten “Spirit of Tradition” Yachts for 2017, according to Stephens Waring Yacht Design. TOP TEN “SPIRIT OF TRADITION” YACHTS FOR 2017. And so it begins: 2017 will be the year the Spirit of Tradition story finally gets set down on paper. 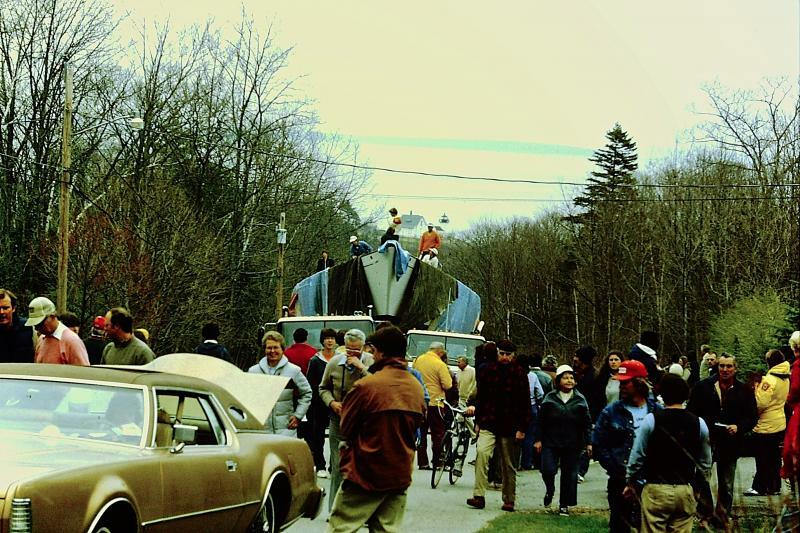 We cannot explain why the world has not bothered to document what went down design-wise in Mid-coast Maine over the past 20 years. 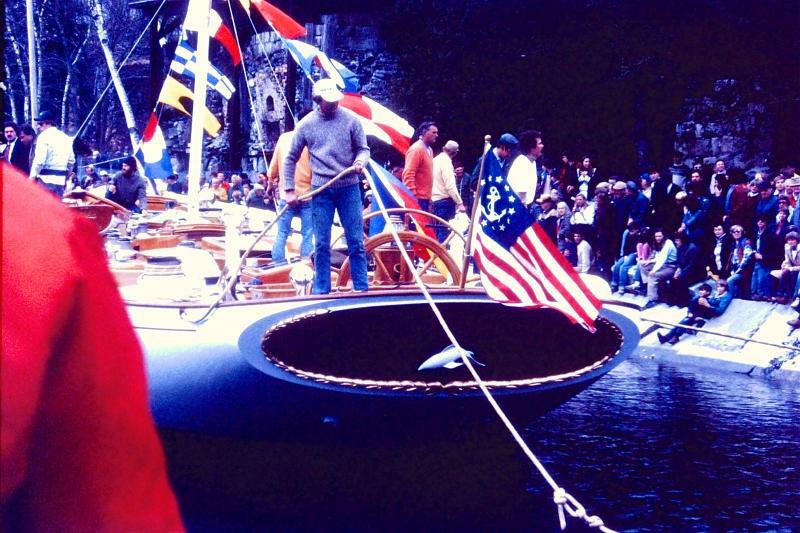 How the talented — and the flawed — mixed traditional classic yachts with modern materials. And how these pioneers pushed back the barriers for performance and design. And changed boating, for better or worse. It’s a story that will take a while to tell. Probably, well into 2018. But this is the year we are on it, at last. Here then is the state of the Spirit of Tradition Art of 2017. Built of aluminum in 1999, at England’s legendary Pendennis Shipyard, and nearly 140 ft. long overall, Rebecca remains one of our favorite defining examples of Spirit of Tradition design in action. Note how her above-water hull and deck are squarely and conservatively styled in the 19th-century classic idiom. But head down below, and she features a Robin Black-designed restrained interior that melds modern luxuries with the highest standards of bespoke modern yachts: 11-knot maximum speed and a library?! All that performance spins out of a cleverly engineered modern underbody and surprisingly cutting edge sail plan. Rebecca may be comfy and elegant. But her Spirit of Tradition performance and ease-of-use make this a beast under sail. She’s an elegant and powerful example of German Frers’ talent. Vortex: Swede 55, Knud Reimers. 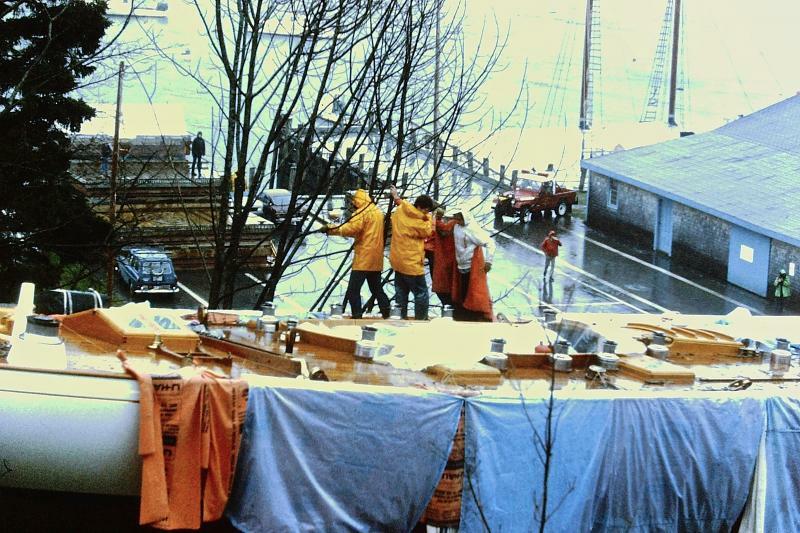 Vortex matters, and not because she’s built of composite wood ( Brooklin Boat Yard, 1990). What makes this boat essential is where she lies on the timeline in the Spirit of Tradition continuum. We suggest the modern SOT era begins in 1975, this Reimers’ Swede 55 square-meter design was penned in ’75 and is good example of our early days of SOT continuum. 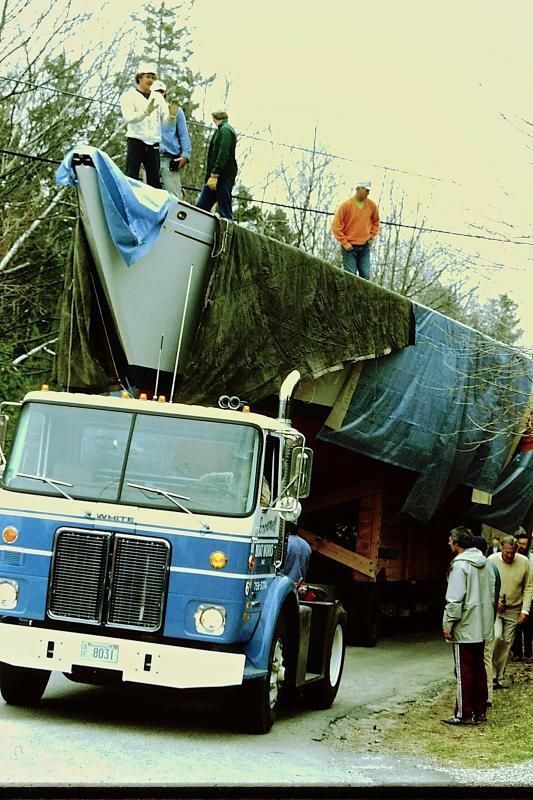 Our industry and any regattas wrongfully tend to treat yachts like this as classics. In past years,Vortex has been classed as an SOT boat only due to her construction material. Dead wrong. 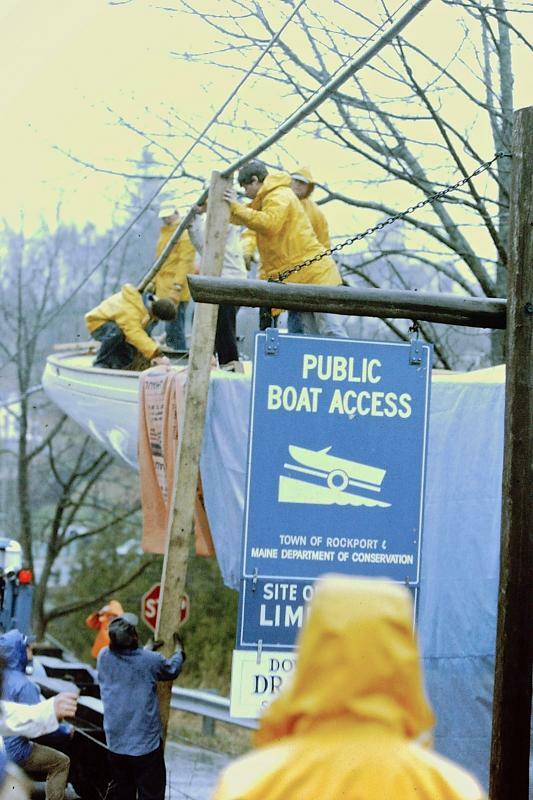 (We’ll leave the broader philosophical discussion for another time as to the difficulties meter-rule boats present to SOT, but is a discussion we feel is important to our narrative.) By our rubric, the year when Vortex was drawn, marks the beginnings of time for SOT and makes clean breaks from previous classes. In part, begins the call and response that stretches back to the characteristics of classic yachts, mixed with modern materials and ideas. She features classic, testy overhangs and a slender hull, a modern underbody and rig. Vortex is the first lovely twist in the naval tale that is the Spirit of Tradition. Wild Horses: W – Class 76, Joel White. Wild Horses is another defining boat in the Spirit of Tradition yacht design. 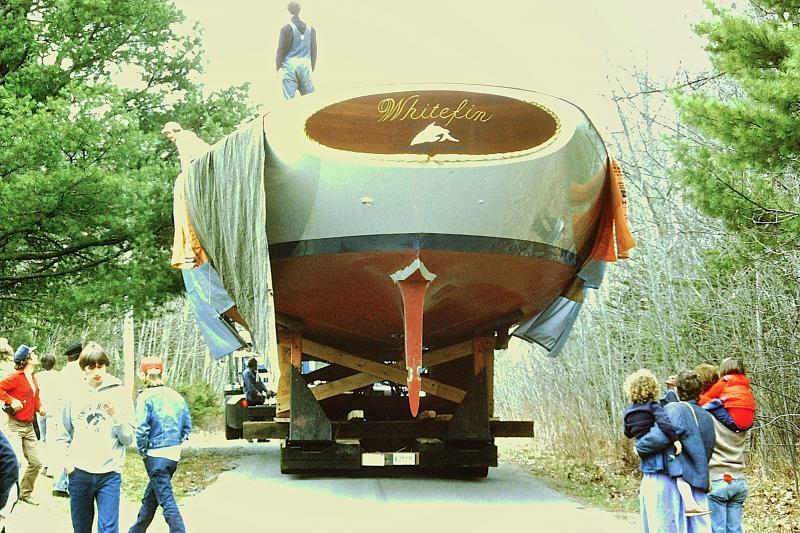 Built by the Brooklin Boat Yard, of composite wood construction in 1998, designer Joel White drew a thoroughbred classic in hand and style, loosely based on N. G. Herreshoff’s NY50’s. But with twin Harken coffee grinders in the cockpit, and other go-fast technology, she’s a complete and utter monster on the race course. Wild Horses remains one of the coolest boats we know, in a lean and dangerous Cool Hand Luke sort of way. She’s fast and weatherly, but still features a classic race-oriented deck, and glorious wide-open interior space below. She’s also the identifiable marker of a design that saw the resurgence of a so-called “active” SOT fleet. We’re intrinsic to the DNA of this design, having a direct hand in her build, her engineering and the rest of W-Class design lineage, with the W-46, and -37 designs. We’re wrapped up in her, on many levels. Hetairos is 67 meters of pure, all-out performance and classic appearance. She was built by Baltic Yachts in carbon composite in 2011. Above and below, she’s stunning; she’s modern; she’s absolute! Hetairos projects all things classic, and aggressive in a boat. But the notion of a wolf in sheep’s clothing blunts the cutting edge she lives on. There’s carbon composite throughout the hull and hardwood veneer throughout the interior. So, not only does the bulb keel lift, but so does the rudder. And while, technically she’s a ketch, both spars carry serious sail plans. That makes her ideally suited for long-distance, relatively short-handed sailing. She could easily cross any ocean, and back, at will. She brags to the world what the Spirit of Tradition means: Eye-catching, head-turning, fast, and modern. If you’re looking for the flashiest entry-point to the SOT story, Hetairos is it. Love. 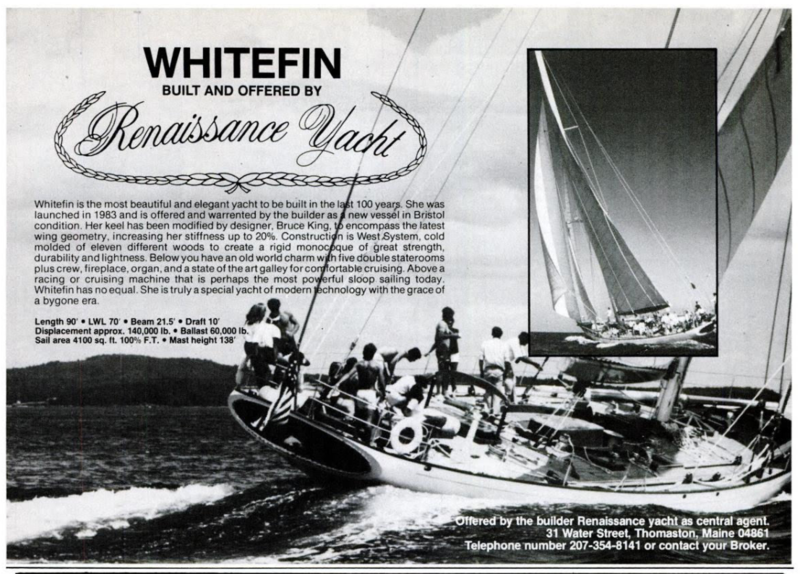 When owner/builder Bruce King built Whitefin in 1983 at his Renaissance Yacht shipyard in Camden, Maine, his 90-foot overall sloop defined the luxury and speed standard in Spirit of Tradition yachts of the time. Built of cedar and epoxy, she proved lovely to sail and brutally fast on the racing circuit. We believe she’s taken home the silver at European Maxi racing stops like Porto Cervo, Saint Tropex, and Imperia. This is nearly 100-feet of one elegant detail after another: The wide oval conversation pit/cockpit; the sweeping staircase down below, the fireplace?! It’s all here. And it all mixes the best classic ideas with the most effective technologies. She’s also available for charter. If you want a rich ripe bite of the SOT experience, a week on her is worth the cost. Savannah, Custom, Pedrick Yacht Designs. Built in carbon composite by Concordia Yachts in 1997, Savannah was a design meant to give off the impression of a century-old yacht. She’s a kind of a Fife-inspired, rust-your-eyeballs-out club racer. And she was a marvelous thing when she hit the water. We believe she won the Best Sailing Yacht Under 36 Meters from the Superyacht Society in 1998. And she probably is the first hi-tech composite build of a vessel with such clearly antique styling. All the details that become standard in SOT boats were in play here: Hi-tech construction, classic cues, modern underbody and rig, and a deliciously crafted interior. If there is a sleeper classic in the Spirit of Traditional club, Savannah is it. 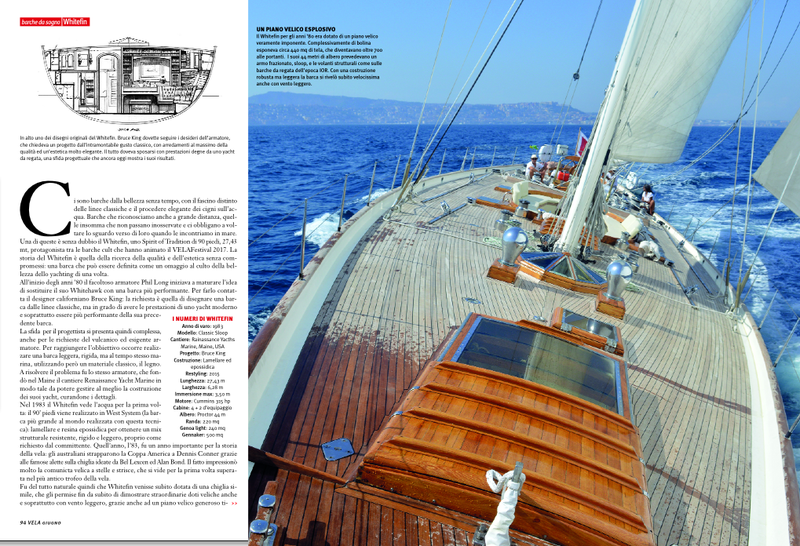 The Wallynano, built by Nedship Group in Turkey in 2008, shows that the word “contemporary” is within the Spirit of Tradition narrative, without bias. At first glance, this day-sailor looks like an ultramodern racer with questionable design lineage. But look closer. You’ll sense a traditional deck house, a narrow wholesome classic pilot-cutter hull form, plumb stem and a lovely stern overhang with a great looking transom. 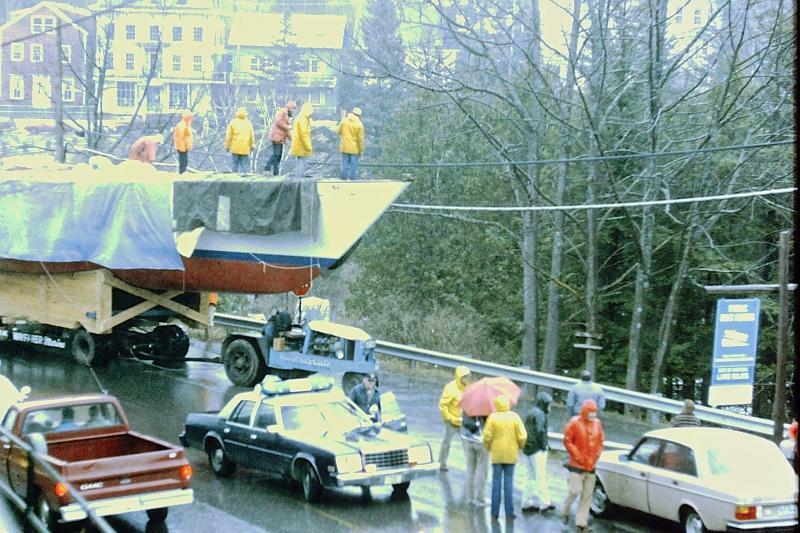 Builder Wally deserves credit for designing the daylights out of this boat: They’ve invested in extensive fluid dynamics models and four different computer-numerically-controlled scale models to get this boat just right. Blend all that research with a great contemporary style and this is a serious Spirit of Tradition design. 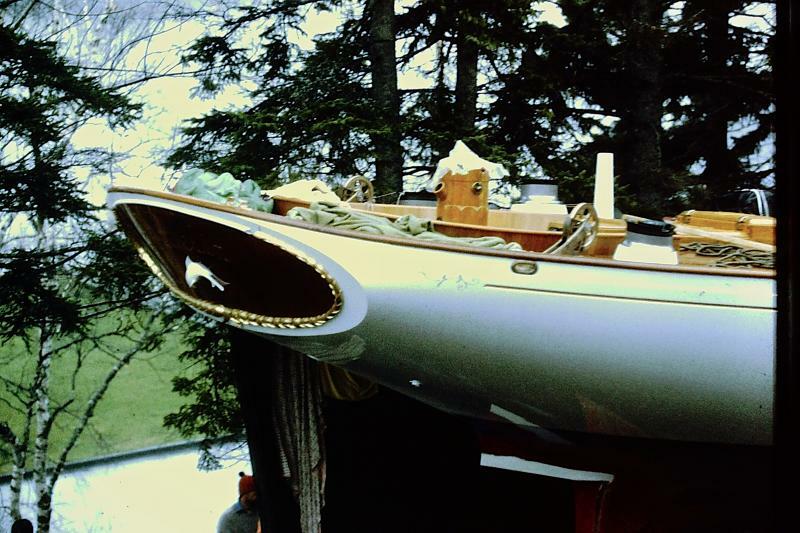 Our hats off to Andre Hoek Design for embodying many of the cues we require in a Spirit of Tradition boat. The Wallynano is a blazing fast, easy-to-sail dayboat that looks great sailing and sitting at the mooring. Bravo! 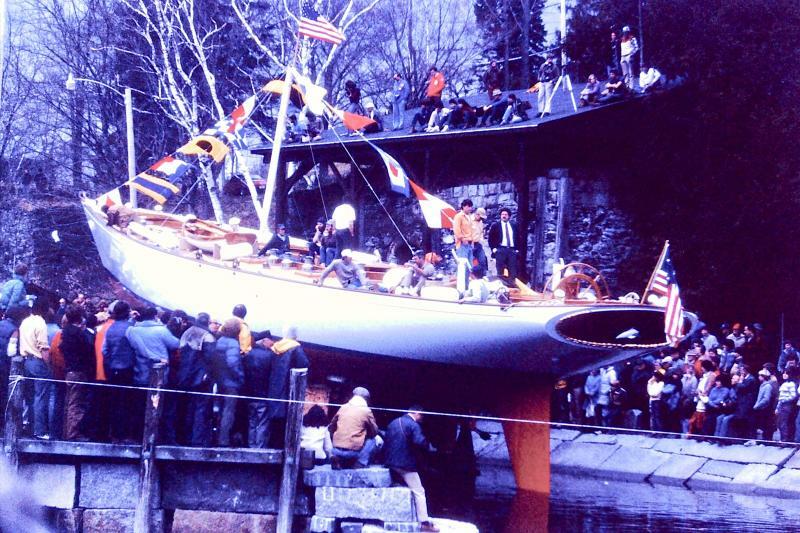 M-Series: Morris Yachts, Sparkman & Stephens. The M-Series, from the venerable production builder Morris, represents the other end of the Spirit of Tradition narrative: Boats that represent a solid entry in mixing the classic with the modern. M-Series boats have little of the showy splash of dramatically new design idioms. Rather, they seek to quietly stretch the boundaries of construction, decor, and target markets. Starting from just 20 feet on the water, M-Series boats are well-suited to advanced and beginner sailors. They serve a critical niche outside the glossy custom yacht industry we mostly work in. We like the intelligence in play: Control lines run back to deep and comfy cockpits, and modern interior details. And down below, we find all comforts well-designed and airy. The M-Series cover the basics of classic lines, modern equipment, and streamlined sailing for Spirit of Tradition boats. Nice work! 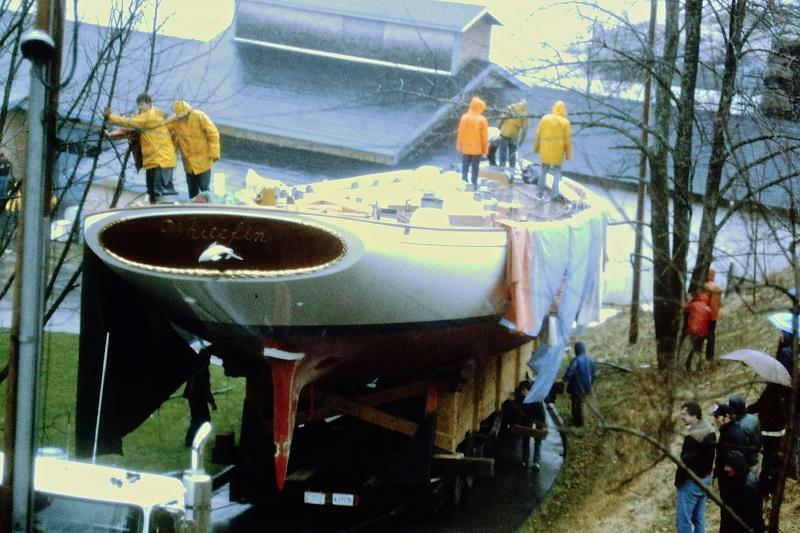 This boat pleases us, as its designers admit the craft was a direct springboard from our W-Class 37, called Race Horse. Take a look at the original and you decide how well they did! German makers Judel/Vrolijk opened up all the aspects that excite us about this boat to the public. with this excellent construction blog. Here you can dig through the details of what it takes to make a Spirit of Tradition pure-performance boat: the use of carbon and wood for hi-tech composite structures; how the sail handling lines were built from scratch to run cleanly, but hidden, underdeck; what it takes to engineer a modern composite spar and running rigging package into a small day sailor; how to finish off the boat with the right modern, limited aesthetic details. Tango is a spirited little daysailer that flies. And isn’t that what we all get into boats to do? Isobel, Stephens Waring Yacht Design. Time for the shameless plug: We believe we can argue with anybody that our recently-finished sloop Isobel pushes the edges of the Spirit of Tradition envelope. She features an edgy superstructure, sleek and modern deck layout, blended with bold and classic lines, stripped down to an elemental standard, dashed with a bit of current design flare. We suggest she exhibits all the elements of style, proportion, technology and performance capability that define a modern Spirit of Tradition yacht. We also understand that she inspires serious debate from those who contend she’s outside the SOT idiom. But that’s why we love her. We tried to create an Isobel that’s neither scientifically classed nor systemically restrained. We were around for the beginning of the SOT movement. And we know in our souls that if these boats are to succeed, the market for them must be vibrant. Stale is for bread, not for design style. SOT or not, we wish to inspire imagination and to attract new and fresh blood into sailing. That’s why we work hard to explore new ideas and out-of-box thinking. To us, that is what the Spirit of Tradition is. Thanks to a friend, we have found the original Whitefin boom! 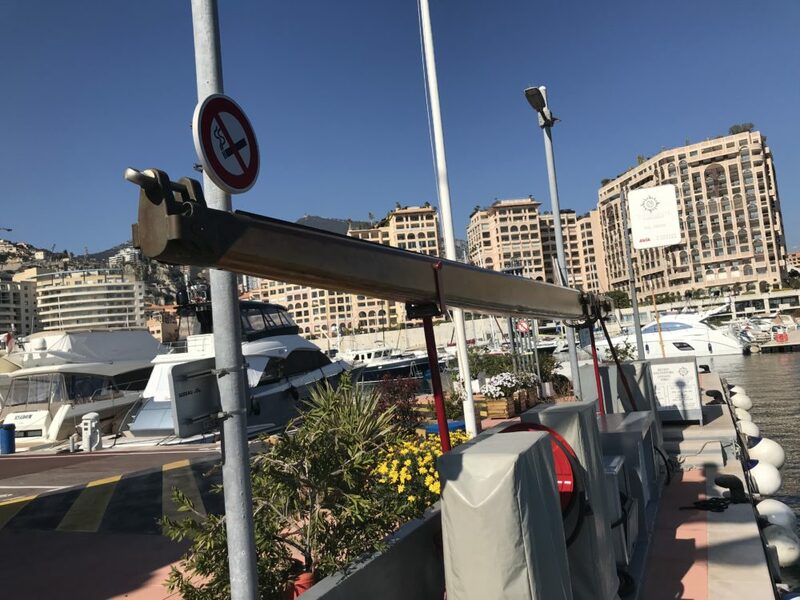 It is adorning the fuel quay in Cap D’Ail, Monaco. Bart Weduwer, who owns the fuel quay, had sailed aboard Whitefin when she was owned by Mario Conde. 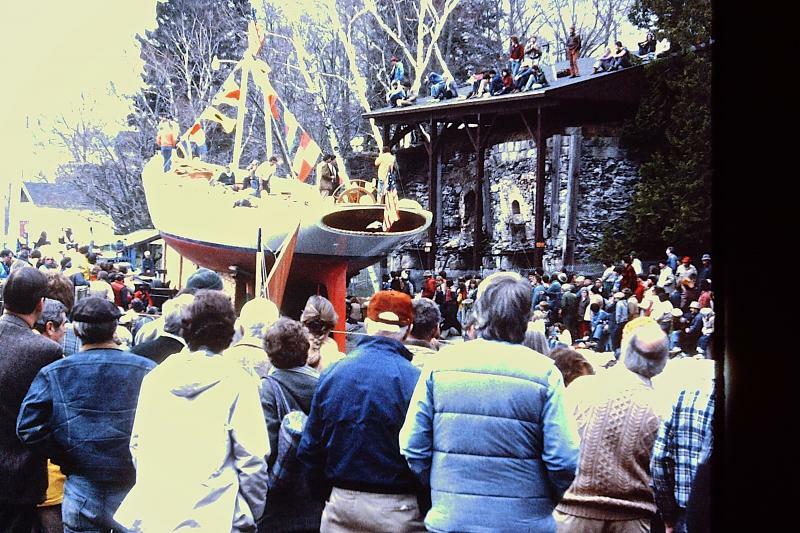 Photograher Joe McGurn has gone through the photos from the mystery boxes that he purchased in 2016 in an estate sale, and he has collated almost 150 that chronicled the launching of the Whitefin, built in Camden Renaissance Yachts. 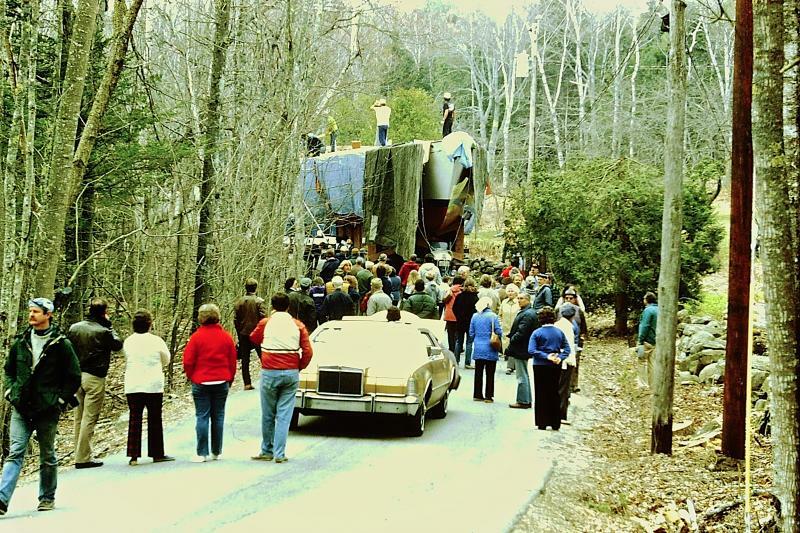 “They are extraordinary photos in which we see the very large boat make its way on the road from Camden to Rockport Harbor,” said McGurn. 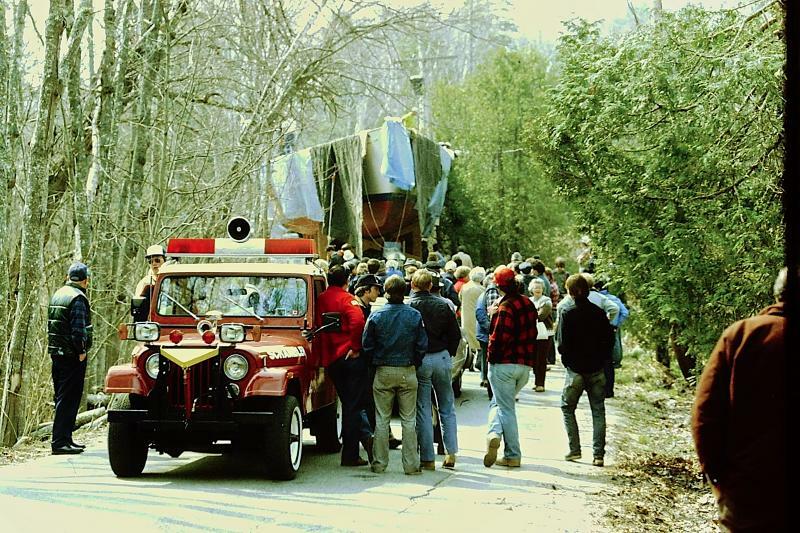 “I’m not sure that this is done today because as you can see they were cutting tree branches and moving power lines to just make it down the road. Whitefin has received a wonderful press report by the Italian leading magazine Giornale della Vela (June 2017).